Friday and Saturday, I and a few others were at the BlogHer ’10 conference in New York to promote Firefox Add-ons to more than a thousand bloggers in attendance. I had a great time and think our presence there was very effective. This is the second event I’ve been to where we’ve focused on getting the word out about add-ons to consumers, the first being last year’s Renegade Craft Fair in San Francisco. Almost all of my time is spent talking with developers and other technical people, so getting the chance to talk to real people who use Firefox and add-ons is fun and educational. I get to learn about things that aren’t obvious to normal users and the problems they encounter. 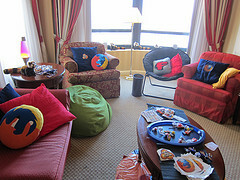 I spent both days of the conference in our hospitality suite answering questions, telling people about Firefox, add-ons, and Personas, promoting the new BlogHer Toolbar, and showing off Firefox 4 features. 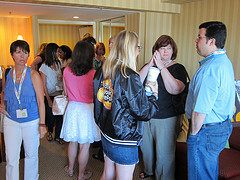 Our suite was packed with bloggers all day both days; I’d estimate we saw at least 600 people come through, most of whom we had personal conversations with. We were heavily promoting Rock Your Firefox, so sticking with its retro theme, we had lava lamps, disco lights, retro candy, 80s music, and cupcakes. Many attendees came back the second day and told us we had the best suite at the conference. While talking with visitors to our suite, I was pleased to hear that the vast majority said they exclusively use Firefox, and many even said they use add-ons. Those who filled out our survey confirmed this, with 90% of participants saying they use Firefox and 65% of those people using add-ons. For folks who said they didn’t use add-ons, I demoed a few blogger-friendly add-ons from the BlogHer Collection and many people said they’d check them out as soon as they got home. I answered a number of interesting questions from current Firefox users — everything from choosing where downloads are saved to managing 50 tabs (answer: Tab Candy demo) to what red pandas have to do with Firefox. Despite the good vibe in the room, one of the most common questions I heard was “why does Firefox crash so much?” from users who said they were on the latest version. We tried to give these users tips on debugging and reporting crashes, but it was disappointing to hear firsthand about the frequent crashes that some people experience. I’m hopeful that our continued efforts at reducing crashes will have a noticeable impact on these users soon.